Following the Silver Jubilee Anniversary of ‘Ekal’, the Ekal Cricket Cup 2014 was the fourth year of a fun filled sports event at Dubai. Friday 11th April 2014 was indeed a special and spectacular day for all members of the ‘Ekal family’ in the UAE region. The venue of the event was Dubai Men’s College Cricket Ground and the program was a full day and night cricket tournament of 8 corporate teams playing and a good sporting audience cheering. The ambience was fun, camaraderie, action and purpose. Ekal and Cricket are a good combination; both make you feel good and nice. With the IPL being announced to take place in UAE, the timing of the ‘Ekal Cricket Cup 2014’ was welcome. •	The chief guest, guests of honor and guests were warmly received by Mr. Harshad R Mehta, Ms. Geeta Chhabra, Mr. Ashit Gandhi and all committee members and volunteers of ‘Ekal’. •	Chief Guest of the program was ambassador of India H.E. Mr. T. P. Seetharam released the Ekal souvenir entitled ‘Glory to Education.’ His speech was truly inspiring stating the importance of these activities that bring about a huge contribution to the development of the country and he was given a special Ekal memento. •	The Guests of Honor were Mr. Arjuna Ranatunga, 1996 World Cup Winning Sri Lankan Captain and Mr. Romesh Kaluwitharan, dashing Sri Lankan opening batsman of the 1996 World Cup and Mr Jitendra Bhansali, Ekal Trustee from Mumbai along with Mrs. Jitendra Bhansali. Mr. Ravi Samarakone was instrumental in getting the cricket celebrities who travelled from Sri Lanka for the event. •	It was interesting to see the chief guests, cricket celebrities and Mr. Harshad R Mehta on the cricket ground playing for a while to the entertainment of the audience. They also briefly addressed the audience; on the good work done by ‘Ekal’ and the advantages of community service. •	The cricket tournament was ably conducted by Mr. Gopal Jasapara and G Force Team with co-ordination by Mr. Sameer Mavani and Mr. Ravi Samarakone. •	Complimentary homemade snacks and craft stalls from the volunteers team, snacks sponsored by restaurants apart from ice cream, tea, water by sponsors. •	Free Health Check was provided by Zulekha Hospital. •	Eight Corporate Houses played exciting 10 over cricket matches; the teams were Jain Social Group, Diamond Village DMCC, DUD Real Estate, Danube Lions, Shrenuj Jewellers, Unique Friends, Brilliant Diamonds and Homes4Life. There was a good combination of cricket commentary interspersed with ‘Ekal’ concept. •	The ambience was colorful – a sports festival which was full of fun, team spirit and community service. Many teenagers had volunteered for the event and this was appreciated by all. •	The final match was between ‘Homes4Life’ and ‘Danube Lions’ teams. Ekal Cricket Cup 2014 was won by Danube Lions. There were trophies given to the best batsman, best bowler and man of the tournament. •	The cricket celebrities enjoyed the program and appreciated the great work done by ‘Ekal’. They signed autographs on cricket bats and balls and were magnanimous in giving three sessions of meet and greet the crowd with photo sessions. They expressed that they would certainly like to be part of the great work we were carrying out on this cause. •	The Ekal Souvenir was distributed as one per family. The souvenir was designed by Mrs. Geeta Chhabra and was well received as it has a variety of photographs of past event, ‘Van Yatra’ of volunteers to different Ekal schools, brief on Ekal concept and 108 ‘Harsh quotes’ – which was a novel inclusion. The thoughts were indeed inspiring – for example ‘ Peace is not only the absence of conflict, but the presence of justice’; ‘think of giving not as a duty, but as a privilege’ etc. •	The target for the program was 500 schools and the team was able to get a commitment for 640 schools. •	Founded on the hard work for several months before by the volunteers it was finally a moment of satisfaction and fulfillment for all. CNBC-TV18, a leading business news channel in India had done a video shoot as part of their ‘Unsung Heroes’ program. It was the first business news channel launched in India and still leads that genre. The channel has been an integral part of the Indian economic story, spearheading and mirroring India's enterprising times. 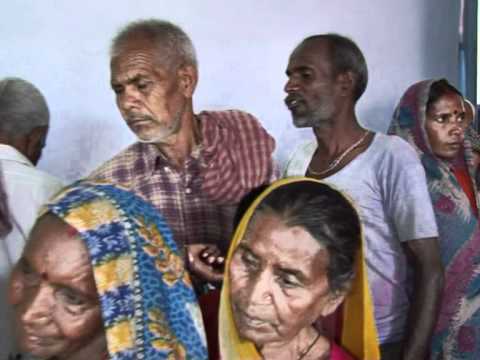 This channel has a unique program called ‘Unsung Heroes’ which covers about socio-economic happenings across the state. CNBC-TV18 covered the Corporate Social Responsibility initiatives of Indian Overseas Bank (IOB), a premium sponsor to the Friends of Tribals Society adopted 100 villages in Nagapattinam, Ramanathapuram, Nilgiri and Dindigul districts of Tamil Nadu during 2013-14. 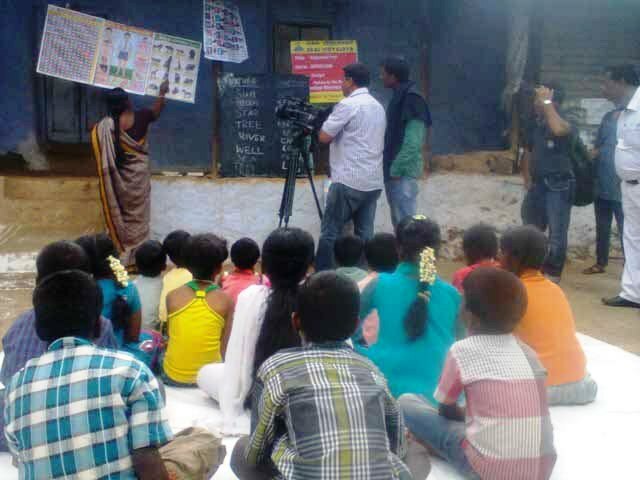 The news channel wanted to cover the Ekal Vidyalayas supported by IOB in Dindigul District. IOB adopted 25 villages of Patchalur cluster in Dindigul District. Hence, Mr. Justin, Manger-Development, IOB-Regional Office at Dindigul approached FTS-Chennai on 10 May 2013. Ms. Veena Krishna, Deputy Editor – Special Projects and Mr. Abhijit S Malge, Senior Producer – Special Projects from CNBC channel came to Kodaikanal with their crew on evening of 12 May 2014. Mr. Kathrikamanathan, Anchal Pradhinidhi from Dindigul District coordinated the field visits. The team was guided by Mr.L. Boopathi, Manager-Corporate Outreach, FTS Chennai to the villages. CNBC team visited 3 villages viz., Kuppammalpatti, K.C.Patti and Solakkadu. In Kuppammalpatti, they covered four different aspects during their video shoot. First, the village atmosphere by shooting the village roads, huts, people with different appearance, etc. Then they shot Ms. Muthulakshmi, Acharya as taking class, teaching letters, numbers, cultural songs. They interviewed Ms. Athilakshmi, Arogya Pramukh to explain about of Ekal Vidyalayas. After the interview with the Karyakartha, two girl students from the same village viz., Baby Ashifa Begam and Shalini were interviewed about their experience with Ekal classes. K.C.Patti village welcomed the team with Kumbam and Aarathi. Ms. Chitra, Acharya and Ms. Ilangeswari, Karyakartha taken over the proceedings. Ms. Chitra, prepared a Arogya Life Chart consisting of different types of leaves found in the locality. The chart containing leaves from Neem, Pomegranate, Papaya, Amla and other trees. She explained the children about health benefits of those trees to the children. 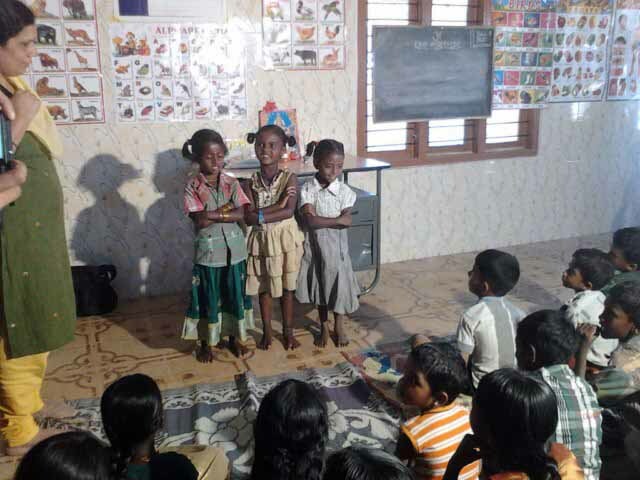 Ms. Ilangeswari took a class on Surya Namaskaar and helped them to practice the same. After Surya Namaskaar, the children performed different types of Yoga postures. The team moved to Solakkadu village and interacted with the teacher Ms. Saraswathi and Mr. Sankar, Karyakartha on the longevity of the Ekal Vidyalayas in the village and how it’s benefitting them. The children lined up to get a smiling shot. After the completion of shooting at Solakkadu village, Ms. Veena Krishna interviewed Mr. Kathirkamanathan. She asked him on how the IOB’s support helped Ekal Vidyalayas. The Bharat Petroleum Corporation Limited (BPCL), Kochi Division, a Public Sector Undertaking, has been actively supporting the Ekal Vidyalaya Movement in Kerala through Corporate Sponsorship for the last four years. During the three financial years 2010-11 to 2012-13, BPCL had sponsored 75 FTS Schools each year at Rs.12 Lakhs per year in Wayanad and had extended financial help of Rs.40 Lakhs to build 7 School buildings in different Tribal belts. During the financial year 2013-14 BPCL has sponsored 100 Ekal Vidyalayas in Idukki Dist. for an amount of Rs. 20 Lakhs. On 29 March, a team of 26 people comprising of Women, Men and Children from the several departments of BPCL, Kochi Division reached Marayoor. The team was led by Mr. P N Sreekumar, Senior Manager (Administration) Ms. K R Girija (Senior Manager-Official Language) and Ms. Elizabeth Davis, (Public Relations Asst.) apart from other ladies, children and family members of the group. FTS Kochi was represented by President Mr. Shyam Sunder Agarwal, Mahila Vibhag, Chairperson, Ms. Sathya Sreepriya and Secretary Ms. Bhavana Parekh. After Lunch at Marayoor, they proceeded to ‘Kovilkadavu’ where accommodation was arranged by Mr. Jayan Varyath, a staunch supporter of our Ekal Movement. Mr. Jayan is the Secretary of Ekal Samithy - Marayoor and is also a reporter of Mathrubhoomi daily. In the afternoon, the team left for Kummittankuzhi, an Ekal Vidyalaya Village. This village is close to Marayoor town and is inhabited by Hill PulayaVanavasi Tribe. In Kummittankuzhi, Ekal Vidyalaya is being held at the community hall where 30 students assembled. Ms. Prema Balamurugan is the Acharya for that School. Mr. Jayan Varyath explained about the activities of Ekal in Marayoor area. The BPCL team communicated with the Acharya and Children and distributed note books, pencils and crayons to them. Ms. Bhavana Parekh, distributed sweets. By evening, the team left Kummittankuzhi Vidyalaya. Thereafter, the team visited ‘Churakkulam Kudi’ Vidyalaya, also an Aadivasi Hill Pulaya colony. On the way they visited various ‘Muniyaras’. Under the leadership of the Mooppan (Head of the colony) the inmates and others assembled in the village. Ekal Samithy President, Mr. V. Moorthy and Ward member Mr. Sojan explained in detail about the Ekal activities. The BPCL team members interacted with the children and their Acharya, Ms. Shivakumari. Ms. Girija, from BPCL spoke about the company’s commitment to Social Service. All the inmates of the colony entertained the guest by performing ‘Chikkumelam’ and ‘Dance’ (Traditional Hill Polaya Folk dance). The BPCL and FTS, Kochi members and Children enjoyed the cultural performances and they expressed that this was a new novel experience for them. The team returned to their base home-stay at ‘Kovilkadavu’, Marayaoor. On 30 March morning, the team assembled at the Melady Panchayath community hall near Marayoor. By about 10 A.M. an interactive session took place with the Acharyas and Volunteers of Ekal. 18 Acharyas, 8 full time workers and 15 Ekal Students took part in this session. Ms. Girija, Mr. P.N Sreekumar, Ms. Suja and Ms. Susan of the BPCL team communicated well with the Acharyas and full timers. Ekal Kerala Bhag Pramukh Ms. P.K Sujatha, Acharya, Ms. Sreekumari, Ms. Anitha, Ms. Radhamani, full timer, Kumari Thankamma, Kottayam Karyalaya Pramukh Mr. P.R Abhilash explained in detail about Ekal activities and their experiences with Ekal. Ms. Girija in her concluding speech expressed their satisfaction and said that this Vana Yatra has given clear idea of One Teacher School run by Ekal Vidyalaya and made them become aware of the good work done by Ekal and its vastness. She also added that BPCL would be in a position to extend further support in the future too. The field co-ordination was done by a team led by Ms. P.K Sujatha involving Mr. T.M Rajashekharan, Ms. M.A Thankamma, Mr. S Roobi, Ms. Aruna Raju, Ms. M.Latha, Ms. R. Prema and Ms. R Deepa. 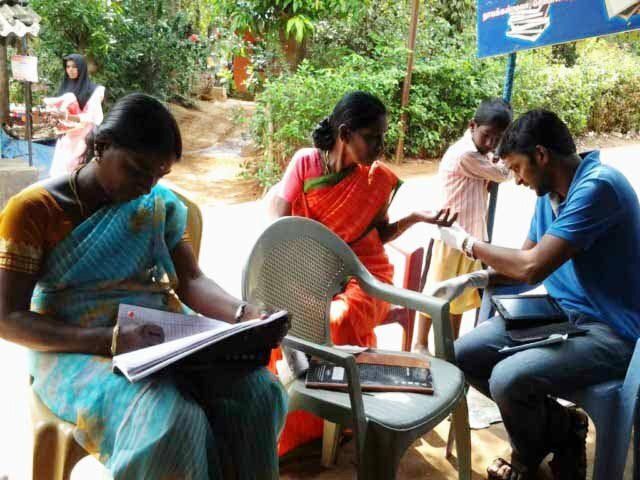 For the first time under the banner of Arogya foundation of India & Friends of Tribal Society-Coimbatore, had taken its first step towards conducting a free Ayurveda Medical Camp for its villages and successfully conducted one in Ettimoola village of Gudaloor panchayat on 20th April 2014. Dr. A Pradeep headed the camp. Dr Pradeep, BAMS is a qualified Ayurvedic physician, running his own clinic in Ooty in the name of Shree Amritha Ayurvedic Clinic for the past 4 years. He has been a part of more than 30 medical camps organized across Tamil Nadu. Ms.Poongothai organized the camp with the help of cluster coordinator Mr.Paulraaj and Ettimoola village coordinator Ms. Parvathi. Villagers form Ettimoola and Nayakenmoola were the beneficiaries. Spreading the home remedy concept was welcomed by the patients as it saves their medical expenses, which is expensive nowadays. Patients range from new born to old age men and women. There were totally 60 patients benefited out of this trial camp. Considering the feedback of this program, the team plans to scale it across its villages on a monthly basis. The camp was over by 3.00 pm with a valedictory note by Ms.Poongothai. Camp was concluded with a good lunch offered by acharya Ms.Parvathy at her residence. Take home message: Helping public to reintroduce our traditional way of healing to treat simple ailments by using Home Remedies or ‘Patti Vaidyam” (Grandma Medicine) in Tamil. Abiyas Warga for Ooty area was conducted in Arogya Training Center at Vishwanathapuram, Rukammal colony, Thudiyalur, Coimbatore between 16th to 20th April 2014. Participants from Gudalor, Conoor, Kothagiri and Mettupalayam took part in this program. There were 6 coordinators and 3 full time employees benefited out of this program. Dr Satheesh Kumar addressed the gathering. Following were some of the topics among the several subjects covered by the resource person's of the camp. Hindu family system and our culture, caution about conversion, daily routine and qualities of an acharya, Hindu stories, Yoga, early morning prayer songs, mother and child care, introduction to anemia and its medicine, climate change and its importance in connection with our food intake, what all we can eat and should avoid (Aagaram), how to manage appetite (Agni). The 5 day camp came to an end with an active feedback session from the participants and a warm valedictory ceremony by Dr. Satheesh Kumar. Resource persons were Mr.Kalidasan, Dr. Krishna Prasad, Ms.Poongothai, Ms. Sathyamani and Ms. Saritha. Mr. Kathirgamanathan from Pazhani, Tamil Nadu has sent an emotionally charged with chronicled events at various stages of his involvement with Ekal and how he has been working for it full time now to Mr. Harish Karat. The letter runs to 3 pages in his mother tongue Tamil. A refugee from Srilanka with keen interest in Tamil literature, Kathirgamanathan came to Tamil Nadu and the family settled in a small village near Dindugal. 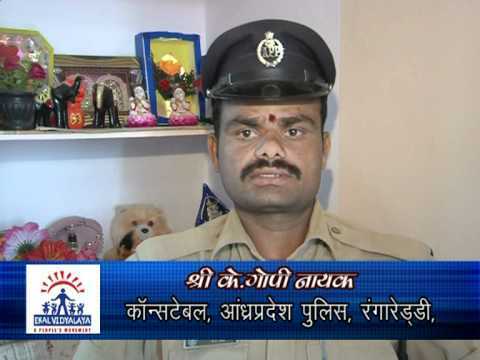 He happened to come in contact with the Ekal activities. 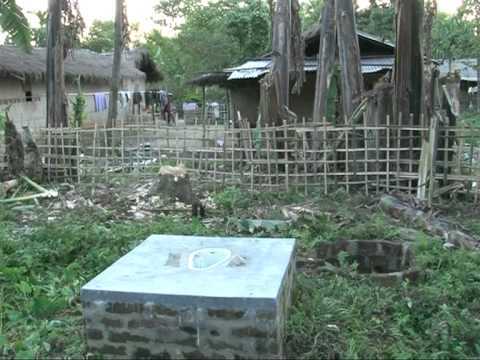 It was in 2000, the volunteers and some office bearers of Ekal movement approached the village for starting the school for his and the neighboring villages. The writer who nurtures great regard for the religion and tradition immediately liked it and became part of it. He had narrated the various activities he has taken up and also how he himself has become a part of Ekal in his long letter. He thanked the Ekal movement and promises to continue his services full time for the development of remote villages and its population. 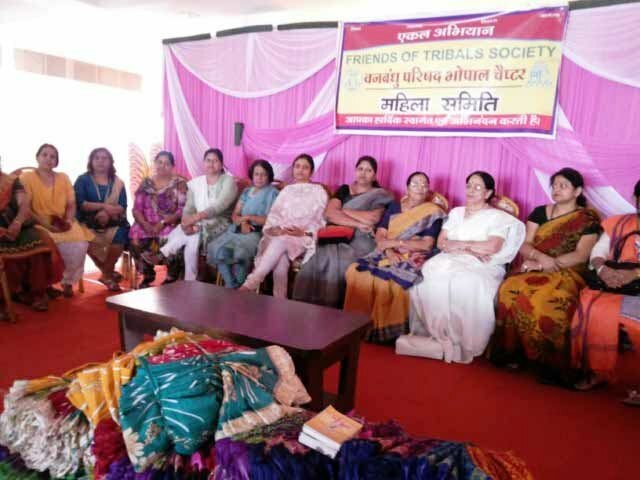 On 15 April, 2014, Mahila Samithi of FTS Bhopal conducted Sanskar Upvan (Cultural Orchard). 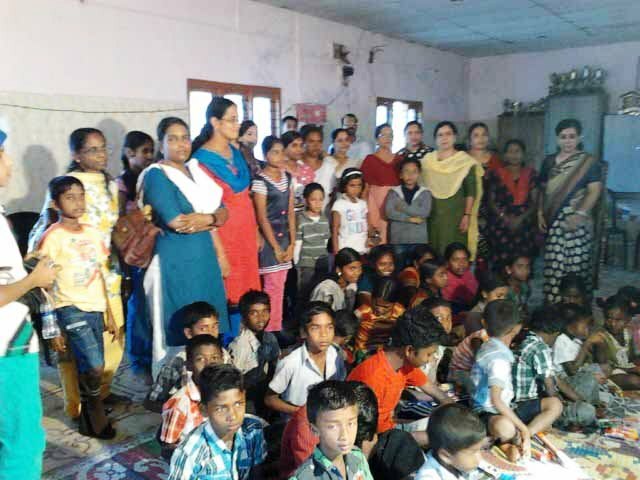 275 members from Raysen Anchal and 30 full time workers were invited with their family. The Program started with a puja. Welcome speech was by Mahila Samethi, President Ms Ranjani Mangala. Later, all the teachers and their mothers and sisters were invited to stage to share their views on Ekal Vidhyalaya. 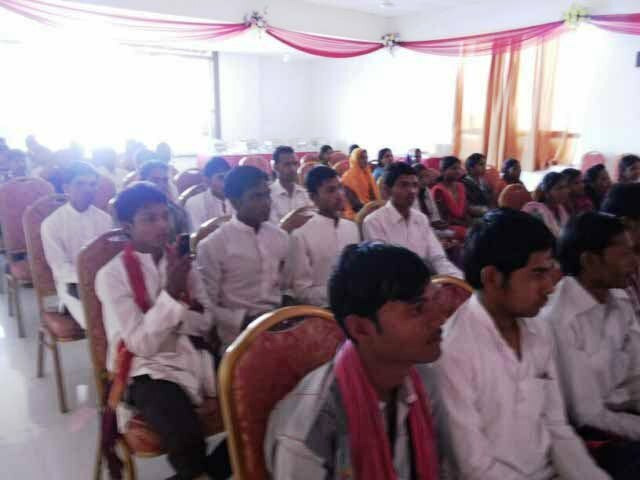 The general view by them was that there was a big change in villages after Ekal came to their villages; like introduction of de addiction, self employment, religious get togethers, children education and culture. 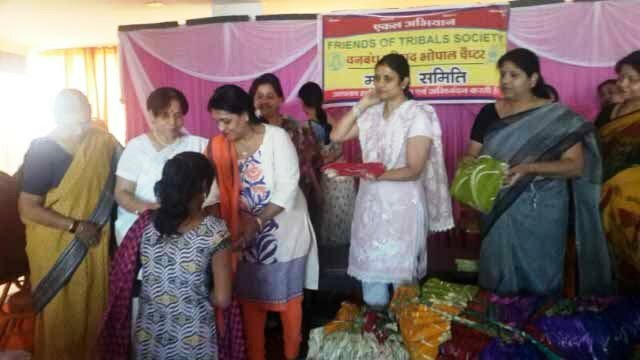 All the relatives of teachers and full time workers were given gifts by Mahila Samithi members. Secretary Ms Kiran Agrawal thanked the gathering. It was an April last week morning when I had the opportunity to take along Mr. Duggal and Ms. Rashmi (from Dubai) to Vanyatra in villages near Palwal in Mewat Bhag. Starting from Delhi, we reached Palwal by 12:30. 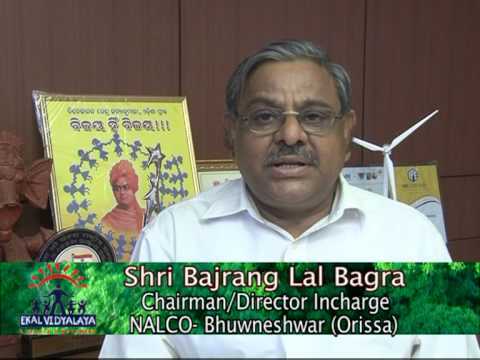 Mr Bhagwat Swaropji administration-in-charge, Palwal Sankul was with us. We reached Gailpur Vidyalaya by afternoon. The children started with Sarsvati Vandna and showed their learning skills including recitation of poems and tables. The couple had interaction with the children of the village and the elders. We were then at Rajoulka village by evening. After Deep Prajawalan and Gayatri Manter, the children solved sums of addition, division and multiplication. Rashmji joined the children in their class by sitting with them on the floor. The couple talked to the children and asked the parents about the difficulties being faced by them.